As a new year rolls around, many people are making resolutions to get fit. However, it is the perfect time for home renovation. 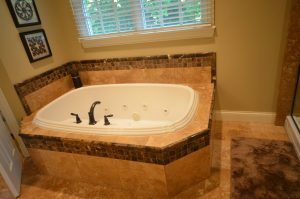 Bathroom remodeling can be a great place to begin. Here are a few tips to consider. Forget the Metal. Many glass shower doors are framed in heavy metal. This appears clunky and often becomes grimy. A better alternative is a frameless design. It will provide a clean and crisp look that will not detract from your tile. Consider New Tile. When you want to change you bathroom’s flooring, it is important to find something that looks good and functions well. Although marble tile may appear elegant, it can become slippery and cause accidents. Choosing slip-resistant flooring is a smarter alternative. Luxury Shower. Many people enjoy a bath, but a tub takes up a great deal of bathroom space. You may wish to eliminate the tub and install a large walk-in shower. If you need somewhere to sit and shave your legs, you can include a shower bench. This is wise for older individuals as well. Storage is a Necessity. No bathroom has enough storage. However, space is usually limited. Adding storage will offer extra places to house your incidentals, including soaps, towels, and other items. Custom-built pieces appear attractive and elegant as well. Change the Fixtures. One of the simplest ways to transform a bathroom is by changing the fixtures. Swapping old faucets, lighting, and drawer pulls for new ones will freshen the space without much time or effort. The experts at Columbus Bath Design by Luxury Bath are waiting to help you ring in the new year with a bathroom remodeling project. They will recommend the most functional and budget friendly designs so that you create a spa-like atmosphere that helps you relax at the end of a busy day. For some ideas, visit the showroom today. Thanks for giving tips on bathroom remodeling, I didn’t know that adding extra storage in the bathroom is a great idea. My mom doesn’t like our bathroom because it looks old and worn out. My dad suggested remodeling the bath and shared this article with her.